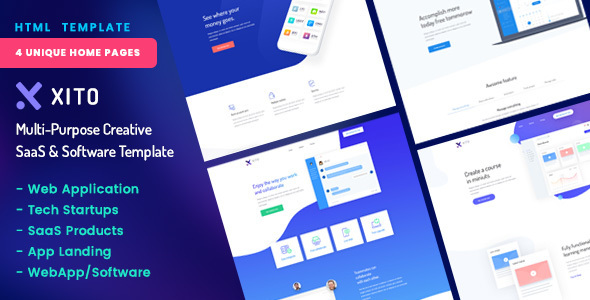 XITO is a modern and elegant template, created for Multi-Purpose SaaS & Software related website. It is designed with unique concept, clean & minimal. XITO is a very good HTML Template, which suites best for any kind of App landing page. XITO SaaS HTML template comes with 4 Home Pages that used for app landing, software landing, webapp. It also has some important pages as features, login, pricing page. We try to designed as many components to do your site better, useful and special features that perfectly fit for All kinds Tech website or any type application related website. XITO Creative HTML is definitely a great kick starter for your next web projects. Feature missing or Need more? Please contact us via support tab, we’ll add that feature for you. Special Note: All images are for preview purposes only and images cannot be supplied in package file and have been blurred heavily.